For the last few days, much of the country has been consumed with talk about Trump’s executive order on refugees. Aside from arguing we should keep our promises to the brave Iraqis who fought with us, I have withheld judgement. There was a lot of confusion surrounding the new policy, and I did not want to make a snap judgement based on incomplete or inaccurate data. After thinking about this long and hard, I have come to a conclusion and would like to share my thoughts, but first I think it is important I clear up some misconceptions, exaggerations, and outright falsehoods. This is not a Muslim ban. The temporary suspension of refugee programs affected seven countries, all of which are majority Muslim, but the policy is based on location, not religion. Hundreds of millions of Muslims all around the world are not affected by Trump’s executive order, and many Christians, Jews, and other non-Muslims are. Yes, Trump spoke about a Muslim ban during the campaign, but that is not what has been implemented. It is part of US law to prioritize minority groups when granting refugee status. In the Middle East, this will mean Christians, and Yazidis, and other religious minorities. This is not new. It is applying federal law. There has been some question about why the new policy applies to the specific seven countries named (Iraq, Syria, Iran, Libya, Sudan, Somalia, and Yemen) and not others, such as Saudi Arabia or Pakistan. It has even been suggested that certain countries were left off the list because Trump has business ties to those countries. No. The seven countries Trump’s executive order applies to are from a list of countries of concern put together by the Obama administration. There is a valid argument to make that Trump should have added or subtracted from that list, but the conspiracy theories are overblown. The 50,000 limit on refugees in 2017 that Trump’s executive order puts in place is in line with the historical norm of the last two presidents. It is important to note that no one who is not an American citizen has a right to come to the United States. We can, should, and do choose to admit foreign nationals to our country, but that is our choice, not their right. One of the primary responsibilities of the United States government is to protect American citizens from foreign attack. It is one of the few purposes for which the government was created. The fact that green-card holders were initially caught up on the new policy demonstrates that it was not well thought out or executed. Green-card holders have been described as equivalent to “citizens who can’t vote.” They live here, work here, and are often waiting years on the paperwork to make them American citizens. They are here because they love America and have already been thoroughly vetted. The Trump administration has since made it clear that the policy does not apply to green-card holders. Contrary to a popular talking point, refugees and other immigrants have killed Americans in terror attacks on US soil. The Tsarnaev brothers were granted asylum in the United States and then planted a bomb at the feet of an 8 year old child. It is often not true that refugees are thoroughly vetted. Part of the normal vetting process for a would-be immigrant is to ask the home country for the immigrants records, criminal and otherwise. By the very nature of their situation, it is difficult to do this with refugees. How many government records still exist in Syria? And considering the Syrian government calls Hezbollah a friend and everyone who opposes Assad a terrorist, could we trust those records even if they were available to us? The United States government exists to serve the American people. People have a right to be concerned about who we are letting in our borders and it is completely within the bounds of reason to alter our immigration policies in whatever way is most beneficial to the United States. Despite the historical connotations of the term and the boisterous way in which Trump has used it, of course the American government should put Americans first. The open borders some people want would weaken what is special about America. But so would giving the impression America no longer welcomes those willing to work hard and pledge allegiance to the United States in exchange for entry. The theory behind Trump’s executive order is not nearly as draconian as his critics suggest, but it’s implementation has been far worse that his supporters have a right to expect. We should obviously do what we can to guard ourselves against would-be terrorists attempting to take advantage of our good nature, but Trump’s policy is ham-fisted, short sighted, and misses a crucial point: America has benefited greatly from immigration in general, and refugees turn into some of the most loyal Americans in the country. In my previous post, I mentioned alternating between being yelled at and having reasonable discussions with protesters. 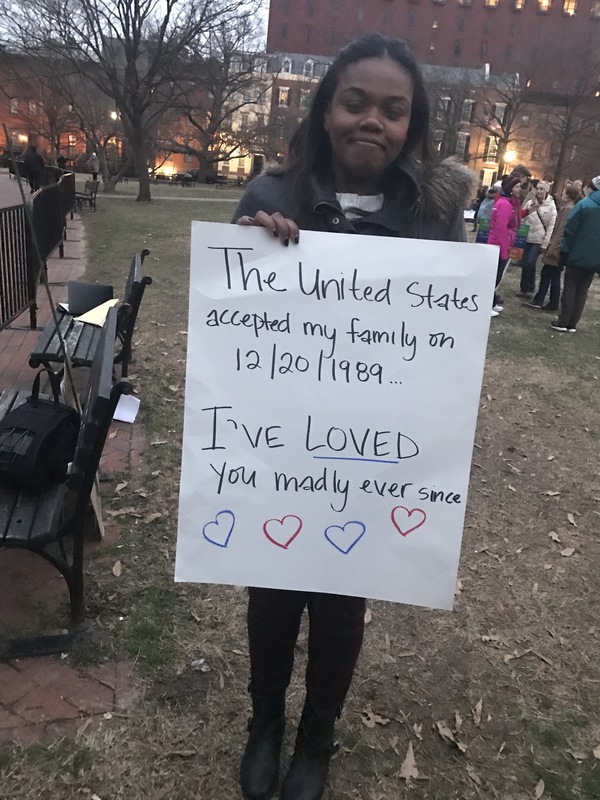 One of those reasonable discussions was with a woman who came to America as a refugee from Sudan when she was four years old. Her gratitude to and love for America was evident in the way she talked about choosing a career designed to serve her adopted country. I didn’t need to see her beautiful sign to know that. Opponents of Trump’s new policy have frequently pointed to Steve Jobs as the offspring of a Syrian refugee and argue we would not have the iPhone if Trump had been president back then. Fine. But when contemplating our immigration policy I don’t think of a billionaire and the amazing gadgets he brought us, I think of the woman mentioned above, and the millions like her who go unnoticed to the larger world, but daily demonstrate they understand and appreciate the unique greatness of the United States. I look into the world and see many nascent Americans spotted throughout. We should welcome our future countrymen home.